It appears that animals, specially primates, have an awareness of their mortality and that of their ilk, and grieve in ways that are strikingly human-like. I’m aware of the hazards and fallacies of anthropomorphizing, but a report in the New York Times shows that even rodents and insects have elaborate rituals when dealing with the dead. 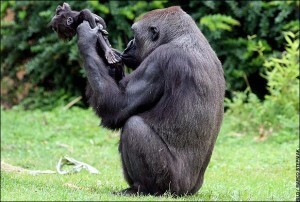 Last week the Internet and European news outlets were flooded with poignant photographs of Gana, an 11-year-old gorilla at the MÃ¼nster Zoo in Germany, holding up the body of her dead baby, Claudio, and pursing her lips toward his lifeless fingers. Claudio died at the age of 3 months of an apparent heart defect, and for days Gana refused to surrender his corpse to zookeepers, a saga that provoked among her throngs of human onlookers admiration and compassion and murmurings that, you see? Gorillas, and probably a lot of other animals as well, have a grasp of their mortality and will grieve for the dead and are really just like us after all. Apprarently, this phenomena happens only if there are visual and other forms of contact and confirmation of the state of death on the part of the surviving creature or group, as it is unclear if animals can wrap their minds around death as an abstract concept. So if I go before our pets, I must leave instructions that they be given a chance to view and sniff my corpse. Just for closure. U.S. Politics as Reality T.V. this is interesting! this only proves our relation as members of the animal kingdom with the primates. maybe, our grieving is very much the same as theirs but we only perceive it differently?